A Collection of Gambrels | Joseph Bergin Architect P.C. Over the past several months, many gambrel roof gables have sprung from our “drawing boards”. In fact one of our house projects, all on its own, contributes eight full gables to the count (it’s a good-sized house). The design of a gambrel roof involves the keeping of a ticklish balance. Too narrow and it looks like a weird-hybrid-mansard; too wide and it may look like a DOT highway building. Window heads at dormers, tops of wall plates and ceiling heights are factors in the equation, as well. But when the balance that’s struck is just right, the gambrel appears as a timeless stalwart of vernacular New England architecture. I believe we are striking the right balance in our gambrel roof designs, mainly due to the number of prospective clients who have come to us requesting them. I will post progress photos as the construction of our gambrel collection picks up in the coming months. 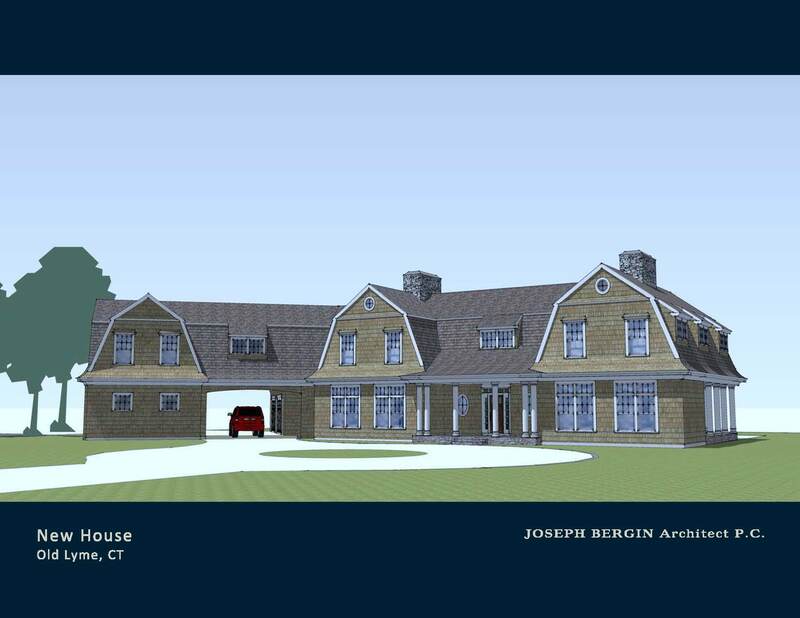 Meanwhile, below are some computer model images from the schematic design phases of two such projects that employ gambrel roofs on shingle style houses. 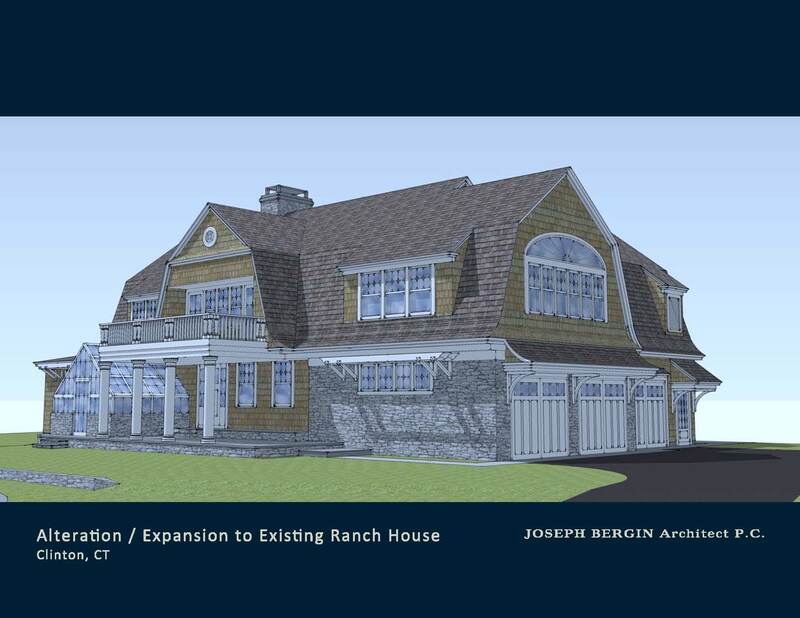 One is in Old Lyme, CT (construction has commenced) and the other is in Clinton, CT (construction won’t begin for some months). The Clinton house is currently an existing 1950’s ranch house. We are making another dramatic transformation, a la our Turkey Hill South project! Other current projects with gambrels are in Old Saybrook, CT and Osterville, MA. Below is a “before” picture of the Clinton house. It is one of our field survey photos. It showcases the stone veneer wall, which will remain intact, and so helps to register the “after” image and give an idea of what is there now. Joe, your work in the Shingle Style arena is magnificent and I think in many ways transformational. Firstly, the proportions of the gambrels in each of these project is spot-on. Your knowledge and facility with the “flowering of the Shingle Style” and the architecture of the American summer is amply displayed here and in your other prior works, including the House on Cape Cod. You clearly have set out to enliven this vernacular tradition with a new openness, liveliness and ingenuity in plan. Bravo Joe! Larry, there’s nothing so gratifying as the praise of a past client. Thank you so much for such a thoughtful expression! Your work still looks fresh yet warmly traditional. We haven’t been in touch as we have been pursuing a finished Gambrel on the water that was built in 2013. The negotiations fell apart this weekend. We still wish we could work on a house with you and wonder if you know of anything with water view. 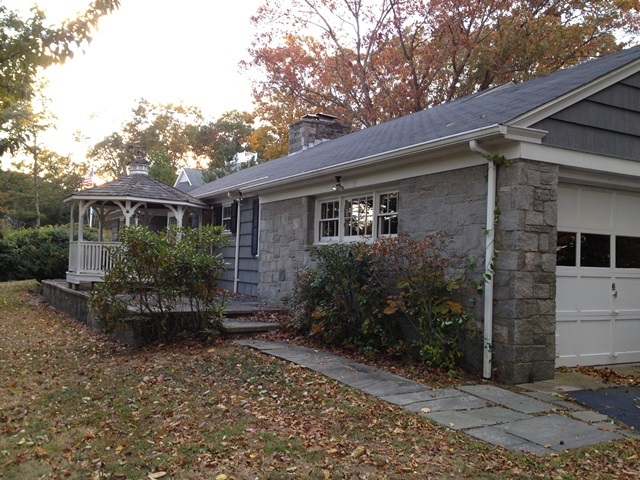 We have looked at potential tear-downs but often the lots are small. We have had a market analysis done on our home and connected with a Realtor. Please keep us in mind if something becomes available in Old Saybrook. Ideally we want something near downtown. Again, we would love to work with you because we have great respect for your talent. If you find time please drop me an email. Hi Nancy! So nice to hear from you again, and thank you for your positive feedback to my work. I am not aware of any parcels that are not currently on the MLS. I will send you an email later today or tomorrow to reconnect.